While the French Riviera or the Greek Islands might seem like the most obvious summer superyacht destination visiting the British Isles can offer the perfect family vacation. With fine dining, secluded beaches and stunning scenery Cornwall has more to offer than you might think. Here we reveal how to make the most of a visit to Cornwall with your superyacht. Berth at: Port Pendennis Marina Port Pendennis Maria is the only fully serviced marina in the region that can accommodate superyachts. It has a large outer harbour with 260 metres of pontoon dedicated to visiting yachts. It also offers unrestricted tidal access with a minimum depth of 4.6 metres. Alternatively if your superyacht is in need of a little TLC then Pendennis Shipyard can accommodate yachts in its wet basin. The Pendennis Yacht Support team can also help with arrival support, customs and provisioning contacts. 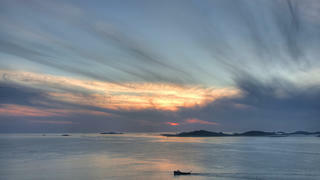 Alternatively drop anchor in one of the many bays and estuaries and explore hidden pathways and beaches by tender. While the French Riviera or the Greek Islands might seem like the most obvious summer superyacht destination visiting the British Isles can offer the perfect family vacation. With fine dining, secluded beaches and stunning scenery Cornwall has more to offer than you might think. Here we reveal how to make the most of a visit to Cornwall with your superyacht. Port Pendennis Maria is the only fully serviced marina in the region that can accommodate superyachts. It has a large outer harbour with 260 metres of pontoon dedicated to visiting yachts. It also offers unrestricted tidal access with a minimum depth of 4.6 metres. Alternatively if your superyacht is in need of a little TLC then Pendennis Shipyard can accommodate yachts in its wet basin. The Pendennis Yacht Support team can also help with arrival support, customs and provisioning contacts. Alternatively drop anchor in one of the many bays and estuaries and explore hidden pathways and beaches by tender. Located at the heart of St Mawes and accessible by tender from Falmouth, The Idle Rocks uses fresh and local ingredients to show off the finest Cornish cuisine. Stop by for a traditional British Sunday lunch on the terrace and take in the stunning views of the harbour. Alternatively arrive in time for a sundowner and then enjoy a three course meal with highlights such as Cornish Monkfish served with wild garlic, gnocchi, celeriac and clams. 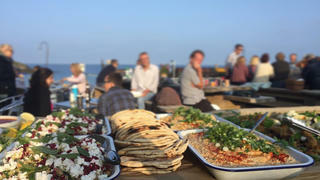 If you are looking for a more rustic dining experience head either to the Wheelhouse or Olivers in Falmouth. Hidden down a side street, the Wheelhouse is considered to be something of a foodies' secret and has a reputation for serving some of the best crab, lobster and shellfish in this corner of Cornwall. Olivers is another hidden gem, run by husband and wife team Ken & Wendy Symons, that concentrates of creating unique dishes from the freshest Cornish produce. Located at the heart of St Mawes and accessible by tender from Falmouth, The Idle Rocks uses fresh and local ingredients to show off the finest Cornish cuisine. Stop by for a traditional British Sunday lunch on the terrace and take in the stunning views of the harbour. Alternatively arrive in time for a sundowner and then enjoy a three course meal with highlights such as Cornish Monkfish served with wild garlic, gnocchi, celeriac and clams. If you are looking for a more rustic dining experience head either to the Wheelhouse or Olivers in Falmouth. Hidden down a side street, the Wheelhouse is considered to be something of a foodies' secret and has a reputation for serving some of the best crab, lobster and shellfish in this corner of Cornwall. Olivers is another hidden gem, run by husband and wife team Ken & Wendy Symons, that concentrates of creating unique dishes from the freshest Cornish produce. If you fancy a round of golf while in the region then head to the scenic Budock Vean Hotel. Originally designed by five-time Open Winner James Braid the challenging course is set within mature parkland. If members of the party are seeking a more relaxing day then they can check into the hotel’s spa for a “Total Temptation” spa day. Meet afterwards for a traditional Cornish cream tea taking in the the stunning grounds and enjoying scones and cakes made to the pastry chef's grandmother's secret recipe. 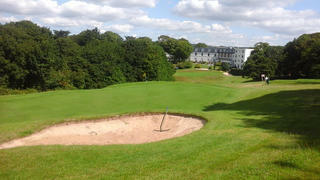 If you fancy a round of golf while in the region then head to the scenic Budock Vean Hotel. Originally designed by five-time Open Winner James Braid the challenging course is set within mature parkland. If members of the party are seeking a more relaxing day then they can check into the hotel’s spa for a “Total Temptation” spa day. Meet afterwards for a traditional Cornish cream tea taking in the the stunning grounds and enjoying scones and cakes made to the pastry chef's grandmother's secret recipe. Charter a helicopter from Castle Air and be picked up from the Pendennis Shipyard helipad to take in the best of Tresco in the the Isles of Scilly. Land on the island and explore the sub-tropical Tresco Abbey Garden. The gardens are home to species from more than 80 countries around the world that flourish thanks to tall wind breaks that can channel the weather up and over the network of walled enclosures. Afterwards head to one of the island's many glittering beaches and watch the sunset over the small islands before returning to Falmouth. Charter a helicopter from Castle Air and be picked up from the Pendennis Shipyard helipad to take in the best of Tresco in the the Isles of Scilly. Land on the island and explore the sub-tropical Tresco Abbey Garden. The gardens are home to species from more than 80 countries around the world that flourish thanks to tall wind breaks that can channel the weather up and over the network of walled enclosures. Afterwards head to one of the island's many glittering beaches and watch the sunset over the small islands before returning to Falmouth. 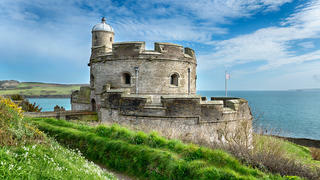 Alongside Pendennis Castle, St Mawes Castle helped to guard the Port of Falmouth for more than 400 years. It is one of the best preserved of Henry VIII's coastal artillery fortresses and its grounds stretch down to the Fal Estuary with views out to sea. If you are lucky you might be able to time your trip with one of the outdoor theatre performances that are hosted during the summer. Alternatively head to the valley of Glendurgan. The waterside garden runs down to the Helford River at the fishing village of Durgan and is filled with an incredible variety of plants and flowers. After your walk around the gardens and maze visit the tea house for a traditional Cornish ice cream. 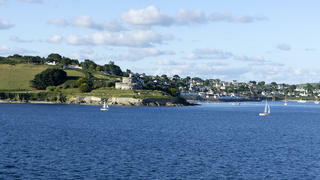 Alongside Pendennis Castle, St Mawes Castle helped to guard the Port of Falmouth for more than 400 years. It is one of the best preserved of Henry VIII's coastal artillery fortresses and its grounds stretch down to the Fal Estuary with views out to sea. If you are lucky you might be able to time your trip with one of the outdoor theatre performances that are hosted during the summer. Alternatively head to the valley of Glendurgan. The waterside garden runs down to the Helford River at the fishing village of Durgan and is filled with an incredible variety of plants and flowers. After your walk around the gardens and maze visit the tea house for a traditional Cornish ice cream.